Fall is a beautiful time of year. 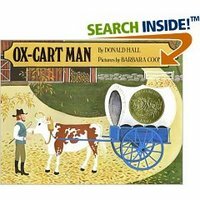 I was discussing with my children's literature classes this week the book, "The Oxcart Man," by Donald Hall. Sometimes adults don't see the beauty in this simplistic picture book. I have always thought that one of the most intriguing aspects of this book is that it starts at the end. The story begins with harvest time and then takes us throughout the following year so that we observe the family preparing for that important harvest time. I think this analogy is very much like helping children learn basic skills. We know what harvest time should look like (the child competently performing necessary skills) and we need to go through the process to really understand how to make harvest time occur for every child. There are no shortcuts, just a step by step acquisition of skills to prepare for the harvest. If you haven't had the opportunity to read the picture book, "The Dot," by Paul Reynolds, you need to do so. It makes me think of how we try to yank kids up to where we want them to function. 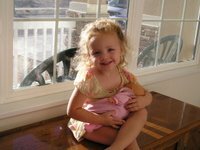 Since we know that children progress developmentally, it makes much more sense to start where the child is functioning and provide support from that point. Adults can forget how difficult it is to learn a new skill, especially without good background knowledge and understanding the "why" of what needs to be done. Good teachers and parents provide support at every developmental stage and always remember to also provide the "why" for learning the skill. Then the child can sign his/her name (see "The Dot" to understand this last sentence)! This REALLY has not been my week! Even though I was recovering from my running incident, I went on a scheduled vacation to Hawaii. My first big experience in a major earthquake! We were without power and water at our hotel for about 13 hours. It was difficult to get food (no restaurants open, etc.) and water. We spent over an hour in line to get into the ABC convenience store to get some water and snacks. I know these are minor inconveniences. There wasn't damage or injuries here on Oahu. We are all subject to natural occurrences. It is amazing how it changes one's perspective! My oldest son turned 30 today. It seems impossible that I have a child that age! Especially since I still feel like I just turned 30 myself. I remember when he began kindergarten. I was a little concerned with his class because it was a paper-pencil-worksheet environment. I was a bit disappointed that there weren't many hands-on activities. My son, who could already read, was thrilled with the worksheet atmosphere. There have been times I wondered if leaving him in that class was a good decision on my part. I guess I will never know. There were indicators throughout the growing years that he missed something important. He's a great guy now and I wonder what would have been different in his life had he had a more developmentally appropriate kindergarten/first grade experience.